Himalayan Salt Licks are from a 250 million year old source of minerals and trace elements for your horse or pony. They are mined from the Khewra Salt Mines at the foot of the Himalayan mountains in Pakistan, and transported by truck and train. These mines give the local mountain people one of their main sources of income. It is said that Alexander the Great discovered the mines when he traveled through South Asia, but in fact it was the horses that first alerted him to this rich mineral source! When Alexander's army stopped to rest, the horses started licking the stones, one of the soldiers noticed this and tasted the rock stone and realized it was salty, thus leading to the discovery of the mines. Himalayan Salt Licks for horses and ponies are obviously distinctive by their color, however it’s not just this that sets them apart from other licks. We like to describe them as salt licks with 'nothing added and nothing taken out' and we believe they are one of the purest forms of salt (sodium chloride) available. Himalayan Salt Licks have been analyzed and have been shown to be predominantly sodium chloride, with other trace elements such as potassium, magnesium (vital for maintaining health) and iron which is responsible for the distinctive rose pink color. 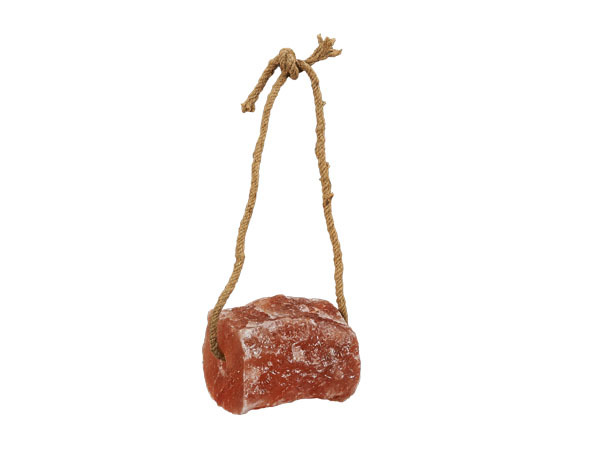 These Rock Salt Licks are literally 'rock hard', which means that horses and ponies are unable to bite chunks off, a problem that can occur with the softer 'pressed' salt licks. The licks are also much more weather-resistant and can be hung up in the field for horses and ponies to “help themselves”, exactly as nature intended. These Crystal Salt Licks can be used in the stable or field. They can be hung on their rope left in the manger or feed bowl for horses or ponies that bolt their feed. They are more resistant to rain than ordinary pressed salt licks but they will deteriorate if left sitting in a puddle of water.